RUSH: So far it’s 81 companies, 81 companies that have announced bonuses, wage increases, benefits expansions, a combination of those or all three. So far, 81 companies. In fact, I have a piece here in the Stack by the guy that does the Dilbert cartoon. His name is Scott something, and he’s got a… I’m having a mental block on his name. 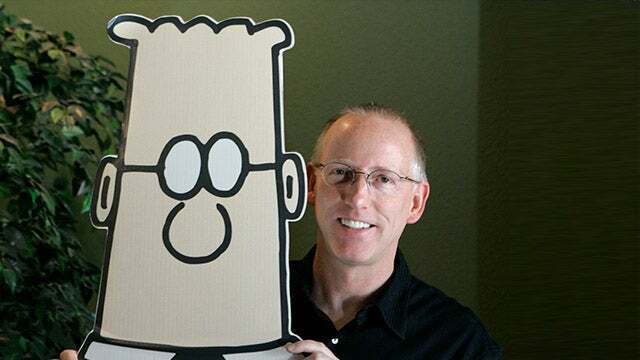 Scott Adams. That’s who it is. He has a theory that we need to change the way presidential approval polls are taken. His headline: “President Trump..” and it’s his blog at Dilbert.com. “President Trump Earns the Highest Presidential Approval Level of All Time — The Small Business Optimism Index hit an all-time high. That’s the new Presidential Approval Poll. … I contend that business optimism — and small business optimism in particular — are the new standard for presidential approval because ‘economics’ captures most of what a president influences. … The point is that all of the ‘big’ issues directly influence the economy via their impact on our psychology and our resources. So Scott Adams says, “I nominate this story for the Fake News Awards. I think it can be a finalist.” They reported this woman, acting as a psychiatrist, claimed that Trump is “unfit for office” and should be dispatched, and she didn’t say that. She didn’t even get close to saying that. Yet it was reported and it was part of a story where 35 other shrinks also said, supposedly, the same thing. So 81 companies and counting, and it’s only gonna increase because the competition for qualified, competent labor is gonna heat up. And that he knew the opportunities for employees to make out really well even increases.